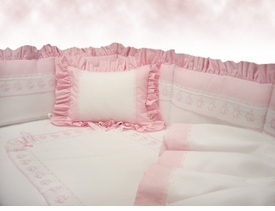 Design your own customized bedding set with our designers that will design each piece to your specifications. 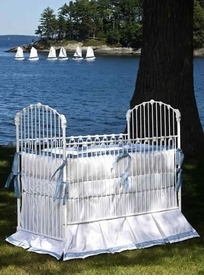 From custom crib bumpers or custom crib skirts, you decide the fabric and style to suit your own nursery. 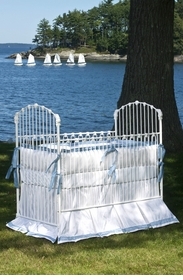 We make sure that each set it made to suit your crib and designed to make sure it fits securely and safely. 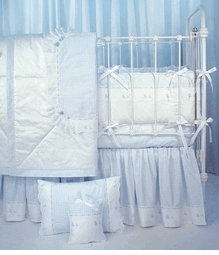 Features custom bedding designers include Blauen, Sweet William, Lulla Smith, Little Bunny Blue, Art For Kids, Lullaby and more. If you want something and do not see it shown here, we can still have one of our designers make you exactly what you want. These are just a few ideas shown below. The possibilities are endless. Please call us and ask to speak to one of our nursery design consultants to help us create your dream nursery, 203-655-0185, ext. 11. Fabric samples and furniture finishes available upon request.